Location: South facing wall of Steveston Hotel on Moncton St. West of Third Ave.
Materials: Acrylic paint on concrete block. Description of Work: Commissioned in honour of the 150th anniversary of Canada’s confederation in 2017, the mural Arrival of the S.V. Titania is based on the oil painting of the same title by eminent marine artist, John M. Horton. The original painting is on display at City Hall. 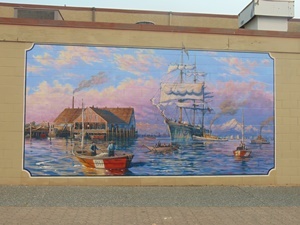 Artist Statement: The mural depicts the sailing ship Titania and its first visit to Steveston harbour in 1889, an important milestone in Richmond’s history as it marked the beginning of the region’s illustrious commercial fishing industry.